This is a complete translation of the Samyutta Nikaya, containing important suttas (Discourses of the Buddha) on such key Buddhist concepts as the Four Noble Truths, dependent origination, the seven factors of enlightenment, and the Noble Eightfold Path. 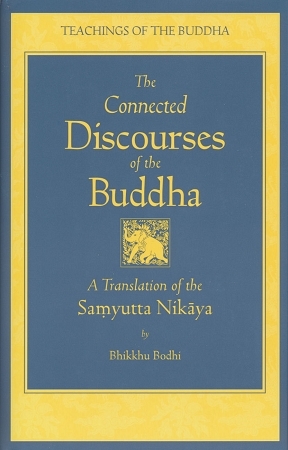 The Connected Discourses of the Buddha ranks as one of the most inspiring compilations in the Buddhist canon. Bhikkhu Bodhi's distinguished and precise translation, his insightful introductory materials, and his extensive notes guide the reader through this vast collection of the Buddha's ancient teachings. This is the third title in Wisdom Publications' award-winning Teachings of the Buddha Series, following The Long Discourses of the Buddha and The Middle Length Discourses of the Buddha. Like its two predecessors, and 2005's anthology of Discourses of the Buddha, this volume belongs in the library of every student of the Buddha. The fourth in the series, The Numerical Discourses of the Buddha, was published in October of 2012.